In the past few weeks the Social Security Administration began sending out letters to employers informing them of a number of names that didn’t match the social security numbers submitted in the employer’s wage statements. The SSA hadn’t sent these letters our for nearly a decade. This year’s letters are significantly different from years’ past in that they didn’t contain any information on specific employees in most cases. The National Council of Ag Employers along with other organizations was provided guidance on how to handle these letters. Please follow the link below to that guidance. The guidance gives a couple different paths you can take in responding to the letters. Read the guidance carefully multiple times before deciding what route to follow. None are wrong. This is just a quick note to make you aware that the Social Security Administration has begun sending out letters to employers commonly known as No-Match letters. These letters were commonplace a decade ago but the SSA stopped sending them out in about 2011. These letters do not tell you exactly which employees have names and social security numbers that don’t match. They only typically tell you to go to a SSA website to find out who they are. They encourage you to use a system on the site that checks the names and numbers. We are in the process of gathering more information and formulating a proper response to these letters. We will post a longer article soon or contact gins directly regarding the response employers should have in reaction to these letters. In the meantime please let us know if you received an SSA No-Match letter. More to follow. According the Atlanta Journal and Constitution, talks to move a much needed disaster package through the Senate hit a snag Monday over funding for Puerto Rico. This is the same funding problem that kept the bill’s provisions out of the spending bill that reopened the Government last month. The disaster program which would bring help to many farmers in the Southeast, has been the subject of a tug-o-war between the President and Democrats that want additional spending for Hurricane Maria in Puerto Rico and the US Virgin Islands. The President is convinced that the money that has already been promised is being mis-managed and has refused to add additional spending to the relief in the region. According to Senator Isakson, over $40Billion has been allocated to help Puerto Rico with more than half not spent yet. Last week, a group of over 30 cotton growers and ginners from the Southeast made a trip to Washington, DC to speak to our representatives about a number of topics facing our industry. The group consisting of from 2 to 9 from each of the six southeastern states visited most of the offices of the Senators and Representatives from their respective states. While a few of the visits were with staffers alone, many of the Congressmen and women met with the groups. 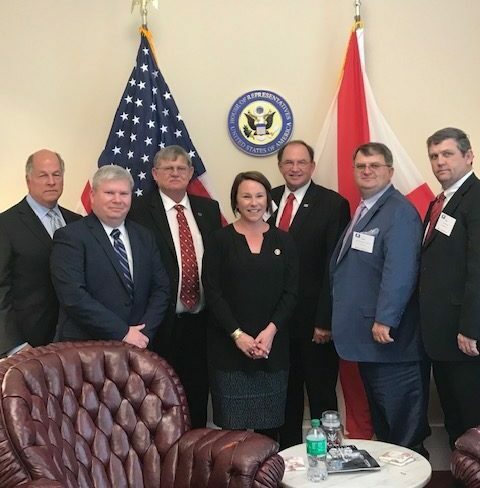 Group meets with Congresswoman Roby, center, following their meeting. The group wanted to relay our appreciation to Congress regarding inclusion in the last year of the 2014 Farm Bill and passage of the 2018 Farm Bill on time and in the process giving cotton the safety net we’ve been missing for some time. Other issues that were on the front of everyone’s mind was Disaster Assistance stemming from the two hurricanes that affected our region last year. Additionally, stabilizing trade and encouraging the President to finalize a trade deal with China were issues that had long term effects. Beginning in 2019 employers that are required to electronically file their OSHA 300A form data will have to do so by March 2. OSHA had been phasing in the electronic rule and has recently finalized an updated rule affirming the March 2 date. Employers with 20 or more employees (at any point in the calendar year) and in certain industries (agriculture is on the list) are required to send in OSHA 300A log summary data each year by March 2 of the following year. So what this means is that cotton gins that had 20 or more employees must send in their OSHA 300A log summary information to OSHA for calendar year 2018 by March 2, 2019.